The first tanks rolled across a battlefield on the morning of 15 September 1916, when British forces attacked the positions of the German 28th Reserve Infantry Regiment at Flers–Courcelette with 32 tanks in an effort to break the stalemate on the Somme. To honour the 100th anniversary of the memorable event, Claire Apthorp takes a look back over the evolution of tanks in the UK. Mobile camouflage system. Courtesy UK MOD. M1A1 Abrams. Courtesy US Army. M4 Sherman. Courtesy US Army. 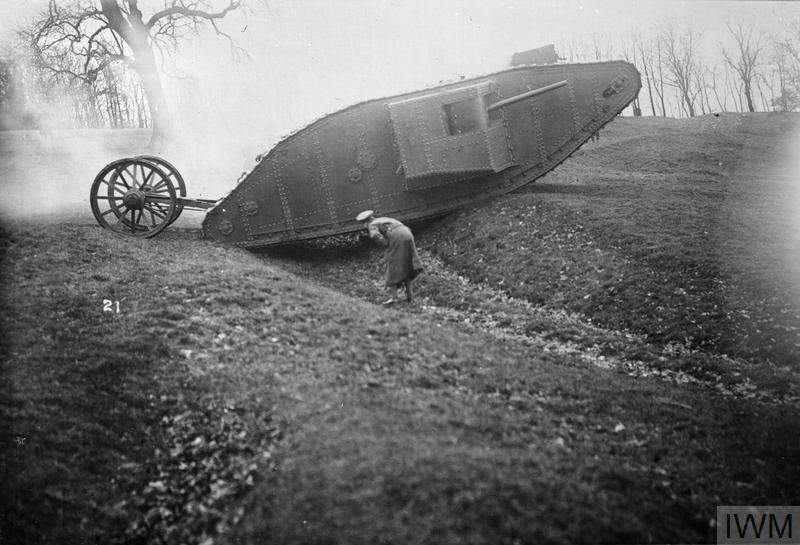 The tanks that crossed no man’s land into German territory on the morning of 15 September 1916 had grown out of an experimental prototype developed the year before by Fosters of Lincoln known as ‘Little Willie’. This vehicle was comprised of components designed and built by a number of industrialists, and drew on technologies advanced under previous projects. It was built on an unsuspended track frame and was fitted with a non-rotatable dummy turret with machine gun mount. It was 8m long, required two men to drive it – one for steering, clutch, gear box and throttle operation, another for the brakes – and four to operate the armament. It was protected with boiler plate and could travel no faster than two miles per hour. An improved prototype – to be known as Big Willie and later, Mother – used a rhomboid track frame that allowed the tracks to move right around the vehicle. The turret was replaced with armament placed in side sponsons. Neither prototypes saw combat, but were invaluable in the development of the technology that would reach the battlefield the following year. Mother formed the design for the first tank to engage in battle with the British armed forces, known as the British Mark I. This vehicle entered service in August 1916 in two variants: ‘male’, armed with two six pounder guns and three 8mm Hotchkiss machine guns and weighing in at 28 tons; and ‘female’, with four 0.303 Vickers machine guns and a single Hotchkiss, weighing in a 27 tons. 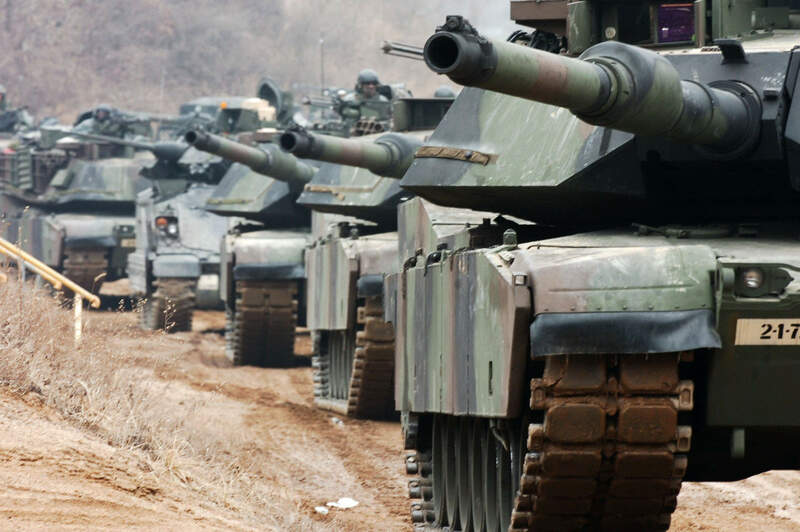 Enough tanks were ordered by Fosters and Metropolitan to raise six tank companies of 25 vehicles each. Due to unavailability of the six pounder guns, half were equipped with only machine guns. Each vehicle carried a crew of eight. Only around a third of the 32 British tanks deployed at the Somme on 15 September succeeded in breaking through to German lines. Seventeen of the 49 vehicles shipped to France were not even fit to enter the battle; of those that did, some broke down, others were incapacitated by direct hits of artillery and mortar shells. The tanks that did clear no man’s land, however, laid claim to a revolution in modern warfare. Despite their shortcomings, they were able to cross trenches of 9ft and pass through barbed wire, showing a capacity for extreme mobility that secured them a vital role in the land force tool kit for the ensuing century. By the time the Mark IV tank entered production in May 1917, significant improvements had been made in armour, armament, logistics and recovery systems for the vehicle. It was the British tank used in the greatest numbers during WWI with 420 males, 595 females and 202 supply variants constructed. A further modified variant with new engine and transmission systems entered production from December 2017, with 200 of each male and female built and the first ‘hermaphrodite’ variants, carrying one male and one female sponson, emerging. 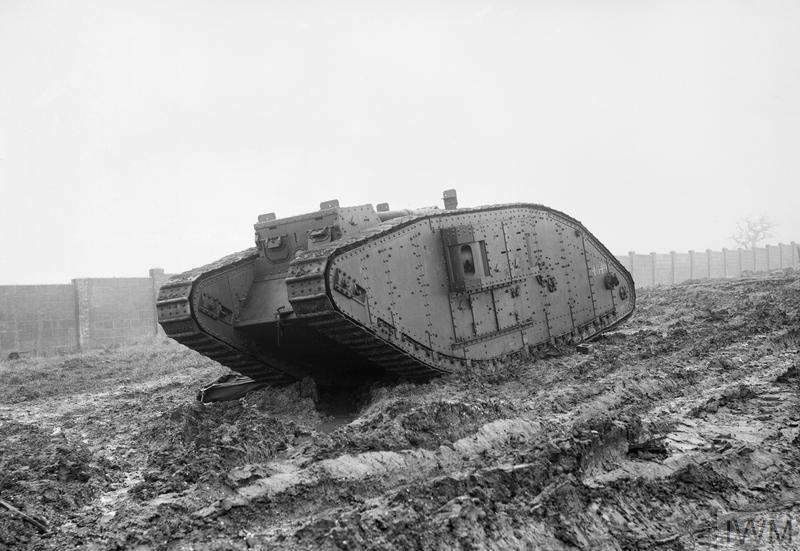 The first major step toward the next phase of tank design came right at the end of WWI in the form of the Mark VIII or Livery tank – a collaborative design between the UK and the US with input from France to equip all three armed forces with a single heavy tank. This tank weighed in at 38t and was 10.42m in length, 3.56m width (with sponsons out) and 3.13m high. British tanks carried a crew of twelve personnel, US tanks carried ten. Armament consisted of two QF 6 pdr 6 cwt Hotchkiss (57 mm) guns, seven 7.92 mm Hotchkiss machine guns or five M1917 Browning machine guns. It was powered by V-12 Liberty or V-12 Ricardo 300 hp (220 kW) engines and had a power/weight ratio of 7.89 hp/tonne (5.79 kW/t). It was protected by 16mm armour. Despite best intentions and planned orders in the thousands, production delays, severe industrial deterioration in France and the end of the war meant that only 125 were ever produced, and only the Americans equipped a single unit with the vehicle. By 1934 the tanks were either in storage, sold to Canada as a training tank, or scrapped. 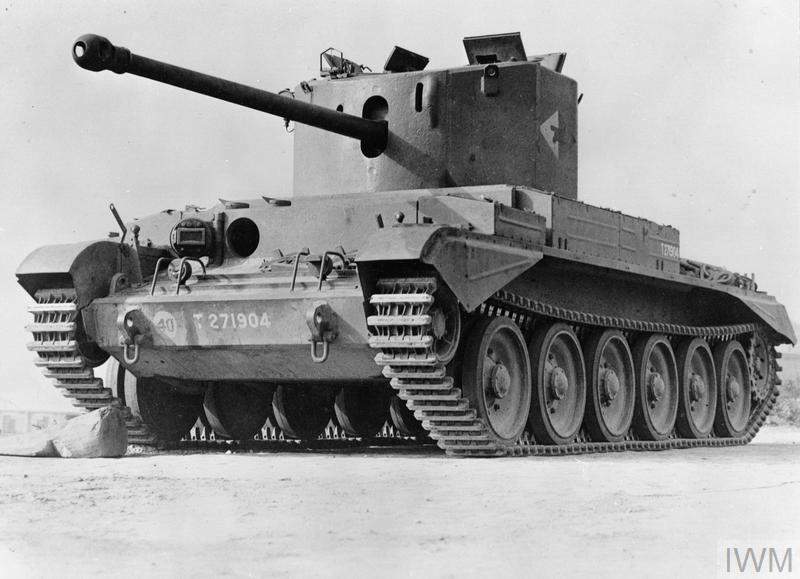 WWII saw the first iteration of the Challenger tank, the A30, in use with British forces. This 32t vehicle was armed with a 76mm Ordnance QF 17 pounder and Browning machine gun and carried a crew of five. Its chassis was derived from the Crowell tank – a highly successful vehicle that first saw action in the Battle of Normandy in 1944, which was appreciated for its balance of high armament, protection, speed and reliability. While over 4,000 Cromwells were built, only 200 Challenger A30s rolled off the production line, with the tank never gaining ground over the cheaper and easier to produce Sherman Firefly conversion tank that was originally built only as a stop-gap until the A30 entered service. The Sherman was based on the US M4 Sherman fitted with the British 17-pounder anti-tank gun. Around 2,000 were produced between 1943 and 1945. 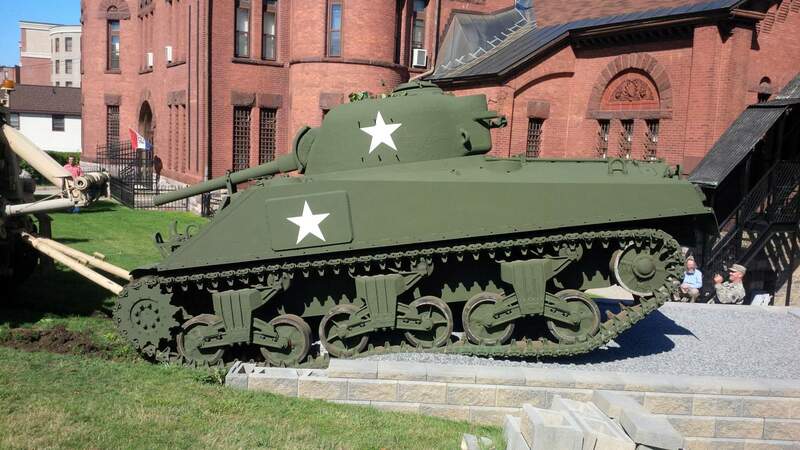 The US M4 Sherman had proved a game-changer for US and allied forces in WWII, proving far more effective against German light and medium tanks on the battlefield and becoming one of the most widely deployed tanks of the war. The tank was armed with 75mm M3 L/40 gun or 76mm gun M1, M1A1C, or M1A2, with a .50 calibre Browning M2HB machine gun and two .30-06 Browning M1919A4 machine guns. Around 50,000 M4 Shermans were produced between 1941 and 1945 in a number of variants. The tank remained in service until the mid-1950s in the US – including the Korean War – and was supplied to a number of NATO armies. The 1980s saw the introduction of Challenger 1 in British service and the M1 Abrams in US service, both of which heralded a major step forward in tank design and capability. Challenger 1 was superseded by Challenger 2 in the mid-1990s. It remains the main battle tank in service with the British Army to date and will remain so until 2035. 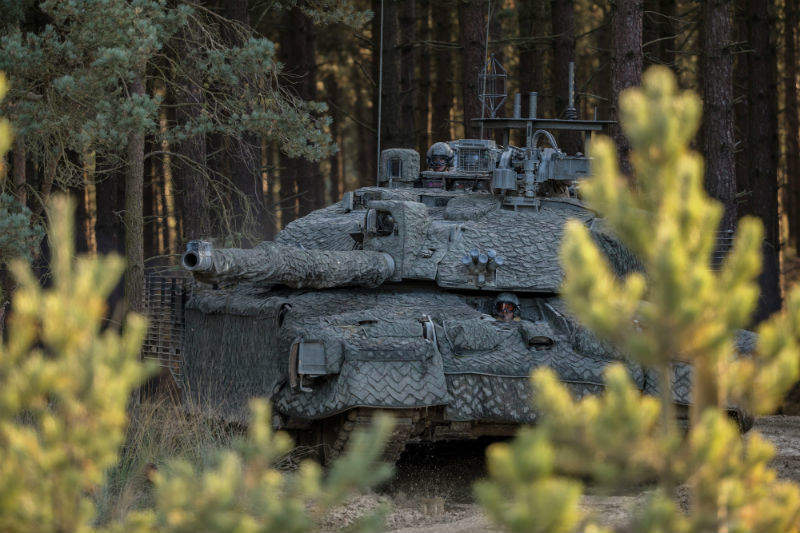 Challenger 2 was one of the first tanks to feature augmented reality in its sighting system, day and night thermal imaging, an advanced digital fire control system for highly stable and accurate gun targeting even when moving at speed over rough terrain. Its main armament is provided by a 120mm gun delivering both armour piercing and high explosive rounds with high protection armour that has protected crew on operations in Bosina, Kosovo and Iraq, with only one Challenger 2 ever lost in combat in a friendly fire incident. In addition to the US military, the Abrams M1A1 main battle tank is in service with armed forces including Egypt, Kuwait, Saudi Arabia, Australia and Iraq. Highly survivable, the tank is armed with a 120mm XM256 Smooth Bore Cannon, two 7.62 M240 machine guns, a .50 calibre M2 and a machine gun on rotary platform. Weighing in at 67.6t it carries a crew of four and features automatic fire detection and suppression, laser rangefinder, thermal imaging night sight, optical day sight primary and auxiliary sights and a nuclear biological chemical system, among others. The next-generation M1A2 can fire a variety of different rounds against armoured vehicles, personnel and low-flying aircraft, with a heavy exterior armour that provides advanced protection to crew. The US Army has employed a camouflage system that provides concealment against visual, infrared, thermal infrared and broad-band radar detection, and a number of vehicles are equipped with a softkill active protection system that impedes the function of guidance systems on semi-active control line-of-sight anti-tank missiles and infrared homing missiles. Looking ahead, the question of which technologies will form the future generation of tanks is much discussed, particularly in light of current Russian developments that put the country’s technology far ahead of what is currently fielded by Western nations. The organisation responsible for the UK Ministry of Defence’s specialist science and technology development, DSTL, is working with QinetiQ to evaluate the use of active protection systems for future vehicles using Challenger 2 as a demonstration platform. These active protective systems are already being put into action by some armed forces as the next step in self-protection – Israel is in the process of fitting its Merkava 4 tanks with the Rafael Trophy Active Protective System. Electric armour is also being investigated to protect against rocket propelled grenades and similar weapons that use shaped charges. Other technologies being considered or trialled include stealth technologies, a mobile camouflage system, electric drive systems that are lighter and more efficient than traditional engines, energy storage systems that could power lasers, much lighter weight armour, advanced suspension and unmanned vehicles that operate in a reconnaissance or route-clearance role for improved force protection. All this technological innovation means that future armoured vehicles could look very different to the heavy tracked vehicles in service with the world’s armed forces today.